Nursing Necklace by Cozy baby – Easy and safe to use teething necklace, perfect for mothers who uses baby carriers with their babies. 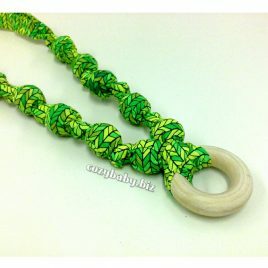 Each necklace is filled with natural, unfinished wooden beads and covered with designer cotton. They are safe for baby to chomp on to relieve those aches and pains of teething or just play with while feeding.